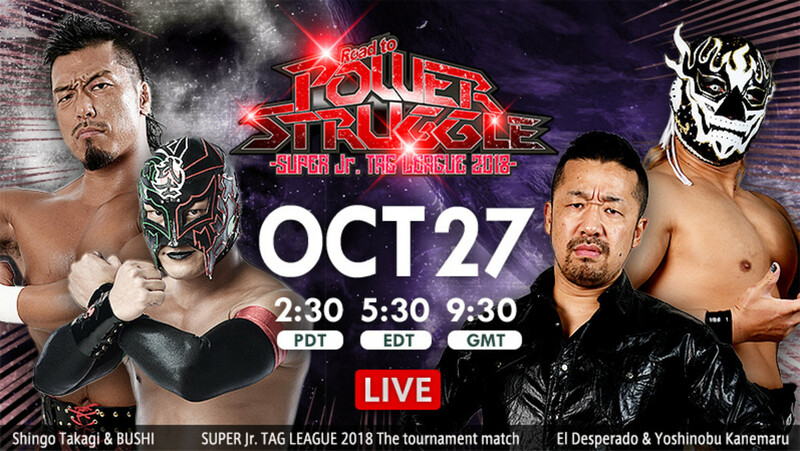 More Super Junior Tag League action goes down this morning as New Japan runs Korakuen Hall once again. Shingo Takagi and BUSHI headline tonight’s show against the current IWGP Jr. tag team champions, El Desperado and Yoshinobu Kanemaru. The LIJ pair are sitting pretty right now, in the lead with eight points. There’s still plenty of matches left in the tournament, however, so it would be best not to let anyone close in on them. Other tournament matches for tonight include Chris Sabin & KUSHIDA vs. Robbie Eagles and Taiji Ishimori, Soberano Jr. & Volador Jr. vs. SHO & YOH and Tiger Mask & Jushin Liger vs. ACH & Ryusuke Taguchi. More heavyweight tag team matches will also fill the undercard. Most of them are the same matches from yesterday, just with a few people switched here and there. A ten man tag team match pitting the members of the Bullet Club against members of CHAOS is the main highlight. Join us for live coverage starting at 5:30 a.m. EDT. There will be English commentary. A decent opener, maybe slightly below the level of the typical Young Lion battles that fill the lower spots on these cards. Tsuji briefly got some offense, but Umino hit a low dropkick, and his team took over. Honma hit a kokeshi, then tagged Umino. Tsuji came back with a dropkick of his own, and tagged Yoshida. Yoshida ran wild, and connected with elbows in the coner and a series of kicks, picking up a nearfall. Yoshida landed some more kicks, but Umino hit a beautiful dropkick. Uemura and Narita tagged in. Tsuji and Uemura hit double dropkicks on Narita, and Tsuji dropkicked Honma off the apron. Uemura applied a crab to Narita, but Umino made the save. Narita used a victory roll to transition to a crab, but Uemura reached the ropes. Narita used a bridging bell-to-belly to earn a nearfall, then applied a crab, and got the tapout. We just got a taste of Ishii vs. Suzuki here, and it was wonderful. Ishii and Goto attacked before the bell. Ishii used a chair on Suzuki, and choked him with his t-shirt. Ishii attempted to whip Suzuki into the crowd, but Suzuki reversed, then attacked with a chair. TAKA worked Ishii over in the ring, then took the ref as Suzuki hit another chairshot on the outside. Back inside, Suzuki hit a yakuza kick in the corner, but Ishii no-sold it. Suzuki and Ishii traded shots. Both stumbled, thne fell at the same time. The crowd loved that exchange. Ishii hit a vertical suplex on TAKA, then tagged Goto. Goto hit a Saito suplex for a nearfall. He went for an ushigoroshi, but Suzuki jumped in and cut him off. Suzuki hit a running PK, and TAKA hit a running knee for a nearfall. Ishii and Suzuki brawled to the back. Goto hit an ushigoroshi and a GTR on TAKA, and picked up the pin. Goto cut a promo on Taichi after the match, and challenged him for the NEVER Openweight title at Power Struggle. Taichi was at ringside doing commentary, and climbed onto the apron. He asked the crowd if they wanted to see the match, then declined Goto's challenge. Goto responded by saying that Ospreay is still coming for the title. They teased some conflict between the Bullet Club and Ibushi, and something between Tana and Ibushi, which plays into Omega and Tana at the Tokyo Dome. The match itself was just okay. Tana, Makabe and Henare all hit ten punches in the corner. The action spilled to the floor, where Yujiro got the advantage on Makabe. Back in the ring, Yujiro and Owens worked over Makabe. Ibushi got a tag and hit a mid kick, then followed up with a series of punches. Makabe demanded more, then countered a right hand with a lariat, as Ibushi took a flip bump. Tana tagged in and hit a dragon screw. Ibushi went for a rana, but Tanahashi turned it into a cloverleaf. Yujiro jumped in for the save, but Tana hit him with a dragon screw. Ibushi went for a standing moonsault, but Tana got the knees up. Tana sold his knees, and Ibushi hit a german, into a double down. Henare and Owens tagged in. Henare hit a diving tackle, a lariat, and a Samoan drop. The match broke down, and all six men jumped in. Owens hit a running knee. Tana hit twist and shout. Ibushi hit a missile dropkick. Makabe hit a lariat. Owens and Yujiro hit a double team elevated neckbreaker, and Owens got a nearfall on Henare. Owens followed with a package piledriver, and got the victory. This started slow, but really picked up by the end, and the post-match was great, as they continue to tease an Okada/Tanahashi alliance. Yano and Fale started out with a couple of comedy spots, before Yano begged off. Beretta and Tonga tagged in and had a really nice sequence. Romero and Chuck jumped in for a three on one on Tonga. The action spilled outside, and the OGs took over. White slammed Okada on the floor, then slammed a Young Lion on top of him. Back in the ring, Tonga and Fale worked over Chuck. White pulled him to the floor and rammed him into the ring frame, then tossed him back inside. Gedo jumped in for a spot, then tagged White, who continued working over Chuck. Jado hit him with a kendo stick from the floor, and Loa hit a blue thunder bomb for a nearfall. Chuck made a comeback. He hit soul food on Loa, then sliced bread on White, and tagged Okada. Okada hit a DDT on White, and a forearm shot to Gedo. Okada hit a flapjack on White for a two count. White hit an uranage, and a flying forearm. Okada went for a dropkick, but White escaped. Okada hit a neckbreaker over his knee, and Romero and Gedo got tags. Romero hit a clothesline in the corner, and fought off an attempted double team from Tonga and Loa, hitting both with ranas. Fale jumped in, but got whipped into the exposed buckle by Yano. Beretta hit a plancha to the floor. Okada hit Gedo with a dropkick. Romero went for a sliced bread, but Gedo reversed it. He hit it on the second try, but White jumped in and hit him with a blade runner, then put Gedo on top of him for the pin. Okada tried to jump White after the match, but he got beat down by Fale and Loa. White went for a blade runner, but Tanahashi ran in for the save. They hit a double sledge on Tonga. They went for one on White, but White bailed out. Tanahashi offered Okada a handshake, and Okada accepted. This was mostly a comedy match, and the comedy was hit and miss. Taguchi and ACH came out wearing Liger and Tiger masks, respectively. The referee wouldn't allow them to wear them for the match, so they did some comedy over removing them. Taguchi did some comedy with Liger, and blew himself up running the ropes, allowing Liger to apply a Romero special. ACH jumped in and broke it up. Taguchi was selling like he had an upset stomach. Tiger tagged in and nailed Taguchi with a right hand to the stomach. He used a stomp to the gut, and a kick. Tiger applied a camel clutch, but Taguchi reached the ropes. Liger tagged back in. He hit a right hand, then an atomic drop. Taguchi hit a hip attack, into a double down. ACH tagged in and business picked up. ACH hit a seated senton off the apron onto Tiger. He hit Liger with a discus lariat and a frog splash. Liger rolled to the floor. ACH missed with a senton attempt off the apron, and Liger hit a lariat. Back in the ring, Liger hit a tilt-a-whirl backbreaker. ACH hit a dropkick, and both tagged out. Taguchi went for a hip attack, but Tiger hit him with a dropkick. Tiger teased a tiger suplex off the top. ACH came in for the save, but kicked Taguchi, allowing Tiger to hit it. Tiger got a two count, as ACH broke up the pinfall. ACH was slightly late on the save. ACH hit a hip attack on Tiger, allowing Taguchi to get back to his feet. Taguchi hit a tiger driver for a two count. They did some comedy involving trading pinfall attempts, and ACH was again slightly late on a save. Tiger went for a backslide, but Taguchi held him down and picked up the pin. This is probably as good a place as any to comment on the English commentary. Rocky Romero and Kevin Kelly are the best commentary team in the business, so perhaps we've been spoiled. Chris Charlton is a great third man in the booth. He's an encyclopedia of New Japan knowledge, and provides translation ability as well. I like Lanny Poffo and I would like there to be a place for him in wrestling, but I'm not sure this is it. Mavs Gillis did a fine job filling in for Kelly, but Charlton had to correct him on some details. Couple that with trying to fit in with Lanny, and this made for an awkward night for all three. They started off hot, and there was a lot of good action, but they lost the crowd at certain points. YOH and Volador started off with a great sequence, and they got the crowd into it right away. Soberano and SHO tagged in. Soberano went for a rana, but SHO cut him off. SHO and YOH doubled up on Soberano, and took over. SHO hit a back elbow. He used a front facelock, and tagged YOH. YOH hit a mid kick, and a bridging suplex for a nearfall. Soberano made his own comeback, and hit a springboard dropkick, then tagged Volador. Volador hit a handspring back elbow on SHO and YOH. Soberano hit a space flying tiger drop to the floor, and Volador followed with an Asai moonsault. Back inside, Volador went for a handspring attack, but bounced right into a deadlift german from SHO. YOH tagged in, but right into an atack from Volador. Soberano hit a tornillo off the top, and a moonsault off the second rope, while YOH was draped in the ropes. YOH went up top, but Soberano hit an enziguri. SHO and YOH hit a superplex/powerbomb combo on Soberano, but Volador jumped in with a frog splash, and all four men went down. SHO and Volador traded forearms. Volador went for a rana, but SHO hit him with a backstabber. Soberano hit the ropes, but ran right into a 3K, and YOH got the pin. A good match. All action. I feel that it would have been better with a slightly slower pace, and maybe five more minutes. KUSHIDA and Sabin ran wild at the outset, but Eagles took over with a dropkick on KUSHIDA's knee. Ishimori tagged in and continued working over the left leg of KUSHIDA. KUSHIDA hit an enziguri, and made a tag to Sabin. Sabin hit a high cross off the top onto both Eagles and Ishimori. Sabin hit a tornado DDT, and Eagles rolled to the floor. Sabin hit a missile dropkick on Ishimori, and got a two count. KUSHIDA went for a moonsault, but landed on his feet, and sold his leg. Eagles and KUSHIDA tagged in and traded elbows and forearms. Eagles hit a cutter on KUSHIDA, and went for a 450, but got caught in a triangle. KUSHIDA slipped to an armbar, then a kimura. Ishimori jumped in, and Ishimori and Eagles both hit superkicks. Ishimori hit an enziguri to KUSHIDA, then his sliding german. Eagles and Ishimori hit tandem kicks for a pinfall attempt on KUSHIDA, but Sabin jumped in for the save. Ishimori went for the bloody cross, but Sabin and KUSHIDA landed kicks. KUSHIDA hit a cartwheel dropkick. Sabin took Eagles out on the floor. KUSHIDA went for back to the future, but Ishimori reversed, and hit a lungblower. Ishimori followed with the bloody cross, and got the pin. Kanemaru and Desperado jumped LIJ before the bell, and they brawled around ringside. Shingo and BUSHI took over as the action spilled into the crowd. They fought up into the second level of the hall, and BUSHI hit a crossbody onto both Desperado and Kanemaru. Back in the ring, BUSHI choked Kanemaru with his t-shirt. Shingo got a tag, and hit a snap vertical suplex, picking up a one count. Shingo went for a running attack, but Kanemaru low-bridged him, and he went over the top to the floor. They brawled into the crowd again, and Kanemaru and Desperado both used chairs. Back inside, Desperado and Kanemaru worked over Shingo. Kanemaru hit a DDT. Desperado tagged in and used a chinlock, then a side headlock. Shingo used a Saito suplex, into a double down. BUSHI tagged in and hit a missile dropkick on Kanemaru. Desperado kicked him in the back from the apron, and Suzuki-gun briefly regained control. BUSHI hit a double rana, and tagged Shingo. Shingo tackled Desperado, and scoop slammed Kanemaru. Shingo hit a basement dropkick to the leg of Kanemaru, then a powerslam. Kanemaru hit a tornado DDT, as Shingo sold his neck. Kanemaru made a tag, and Desperado stopped Shingo from making a tag, sending BUSHI off the apron. Desperado came off the ropes, right into a death valley driver, allowing Shingo to tag BUSHI. BUSHI jumped in, but right into a spinebuster from Desperado. Desperado followed with a swinging neckbreaker. He missed a back elbow in the corner, and Shingo jumped in for a lariat. BUSHI hit an enziguri, and covered, but Kanemaru jumped in to break it up. Shingo hit a bomber. Shingo and BUSHI went for rebellion, but KAnemaru and Desperado countered. Three men rolled to the floor. BUSHI went for a suicide dive, but Desperado side-stepped, and he went crashing into Tsuji, the Young Lion. Kanemaru hit a running kick into a side slam from Desperado, but Shingo broke up the pinfall attempt on BUSHI. As Shingo and Kanemaru brawled to the floor, BUSHI spit black mist and used a backslide, but Kanemaru stopped the count, pulling the referee out. Kanemaru spit whiskey mist, but BUSHI ducked it. Desperado hit a low blow, and got a two count. He pulled off BUSHI's mask, and used the opportunity to roll him up for the pin.